The Philippines-Palestine Friendship Association has issued the following statement of support and solidarity for Palestinian prisoners on hunger strike. This statement comes alongside the important solidarity message from Filipino revolutionary political prisoners standing with Palestinian prisoners on hunger strike for dignity and justice. The PPFA joined the International League for People’s Struggles in the Philippines and BAYAN to express solidarity for Palestinian prisoners and highlighted the prisoners’ strike at a demonstration on 17 May in Manila outside the U.S. Embassy. 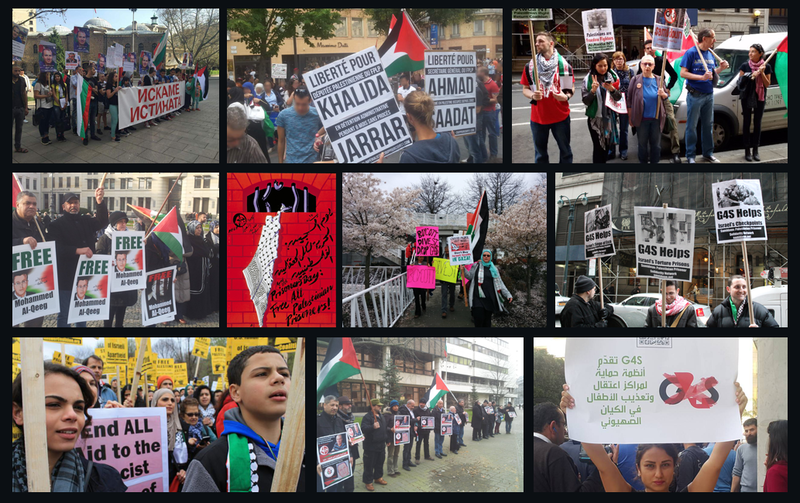 The ILPS, of which Samidoun is a member organization, has been deeply involved in solidarity with the Palestinian prisoners’ struggle in the United States, Canada and Europe as well. Samidoun Palestinian Prisoner Solidarity Network salutes the PPFA and the Filipino people’s struggle for justice and liberation. Stop the US war machine, from Palestine to the Philippines! The Philippines Palestine Friendship Association supports the ongoing hunger strike of the Palestinian political detainees held in prisons all over Israel and the occupied territories. Hundreds of Palestinian prisoners are holding a hunger strike called “Strike for Dignity” to protest the Israeli’s violation of their human rights including medical neglect, arbitrary Administrative Detention, denying family visits and solitary confinement. The hunger strike started last April 17 which marks Palestinian Prisoners’ Day. The Zionist Israeli government has captured and detained some 6500 Palestinians including 200 children and 19 mothers. Five hundred prisoners are held under Administrative Detention orders without charges or trial. The Palestinian people are fighting for liberation against Israeli occupation, apartheid and political repression. US imperialism supports Israel, which is historically the biggest recipient country of US military aid in the world. We enjoin all freedom loving Filipinos to support the struggle of the Palestinian political prisoners and the Palestinian people for dignity and freedom from Israeli occupation, as we ourselves advance our struggle for national freedom and democracy. Free all political prisoners in the world! Long live the Palestinian people’s struggle for freedom! Down with Zionism! Down with US Imperialism!